We are delighted to introduce the new range of pallet truck scales made from stainless steel for use in ATEX 2GD and 3GD zones, series TPWI"EX"
Stainless steel pallet truck scale for ATEX 1, 21, 2 and 22 zones. • Maximum lifting capacity: 2000 kg. • Operating life of about 150 hours. • Programmable automatic power-off for battery savings. • Standard weighing functions (reset, tare, manual tare). • Up to 8 advanced weighing functions. • Pair of anti-static steering wheels for tiller. • Special versions on request: wide forks, long forks, special carrying capacities/divisions, high-resolution weighing. 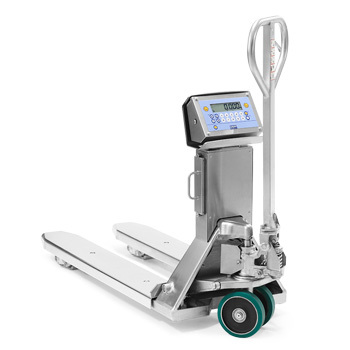 Stainless steel pallet truck scale for ATEX 2 and 22 zones. • Operating life of over 100 hours.